Last year a group of us from Bishop’s Cellar had the opportunity to visit one of our German wine suppliers in the charming old city of Wurzburg located in the Franconia region in the German state of Bavaria. It was my second time in Wurzburg, as I had spent an Easter weekend there once many years ago, and recalled the town and its wines fondly. At that time, I was living in Italy’s Piedmont region and the refreshing mineral white wines of Wurzburg were a pleasant contrast to some of the bolder tannic reds I had been drinking in Italy. Both styles I love; but the elegant aromatic wines I tasted in Germany were just what I was craving as the weather warmed up. If you haven’t had a good German wine in a awhile or you shy away from buying them because you’re unsure how to decipher the labels, the wines of Weingut am Stein could be just what you need! Weingut am Stein is a family venture; Ludwig Knoll is the present-day owner and winemaker. It was his great-grandfather who, in 1890, set up a cooperage in Wurzburg to supply local wineries with his barrels. In 1980, Ludwig’s father established a winery on a prestigious piece of slope; the Wurzburger Stein, and since 1990, Ludwig and his wife Sandra have managed the winery and business together. The vineyards and winery are managed according to organic and biodynamic principles. Ludwig and Sandra wish to cultivate sustainable practices for the environment but also work to instill in their own children values of respect for the land and the recognition of the interconnectedness of all nature. What was evident to me upon meeting Ludwig and Sandra, and enjoying a lovingly prepared home cooked meal in their home surrounded by sloping vineyards, was that wine and food connect us to culture, history, geography, and ultimately, to each other. Here we were, a group of relative strangers, enjoying an intimate meal and being brought together by means of sharing wine. 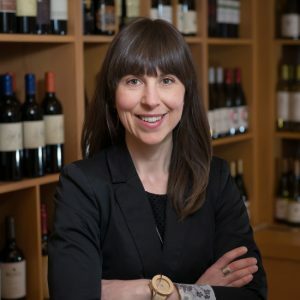 Since 2015, Bishop’s Cellar has been importing the wines of am Stein to Nova Scotia. We always have some core products that are available year round (until they sell out!) plus special release wines whenever we can get them. Bishop’s currently has a great selection of the am Stein portfolio in stock and we are pleased to be able to offer a range of exciting wine styles; a traditional method sparkling rose that rivals Champagne, a dry Pinot Noir rose that is perfect for Spring, an eclectic and uber trendy Pet Nat Pure and Naked Pet Nat (sold out already!) and a mineral-driven Wurzburg Sylvaner in the traditional bocksbeutel (don’t be deterred by the shape of the bottle, this is a serious wine; no Matteus here! The bocksbeutel has been used for the best wines of Wurzburg since 1728). I can’t say enough about their Muskelkalk Riesling for it’s drinkability and balance which has me dreaming of warmer days and patio entertaining. Finally, if you are an old world Pinot Noir fan and are looking for something more affordable than Burgundy, am Stein’s Spatburgunder will satisfy even the most discerning palate. Check out the wines of am Stein on the carousel below and taste a bit of Spring in a glass!